As promised, I will start a quick series of a few Canarian natives, some seen in the botanic garden (posted yesterday) so I know the names exactly, and some seen in the wild that I hope will be named accurately. The flora of the islands often features genera that are familiar to us but, due to the isolation of the islands and the, often harsh, climate, the plants have evolved in a different direction, in many cases becoming larger. While it is not quite ‘land of the giants’ the flora here, in common with other island flora, has developed big plants. But apart from that, many of the plants have adapted narrow or grey leaves against drought and some bloom in winter when the weather is more suitable for growth, being cooler and wetter. Remember that the islands offer plants a wide range of habitats so generalisations are tricky. So first, Euphorbia atropurpurea var. atropurpurea. This beautiful small shrub forms a perfect dome of grey-green leaves when in its prime, later becoming less symmetrical and getting more character. It is found in the wild only in south Tenerife and in a few barrancos in the south west. 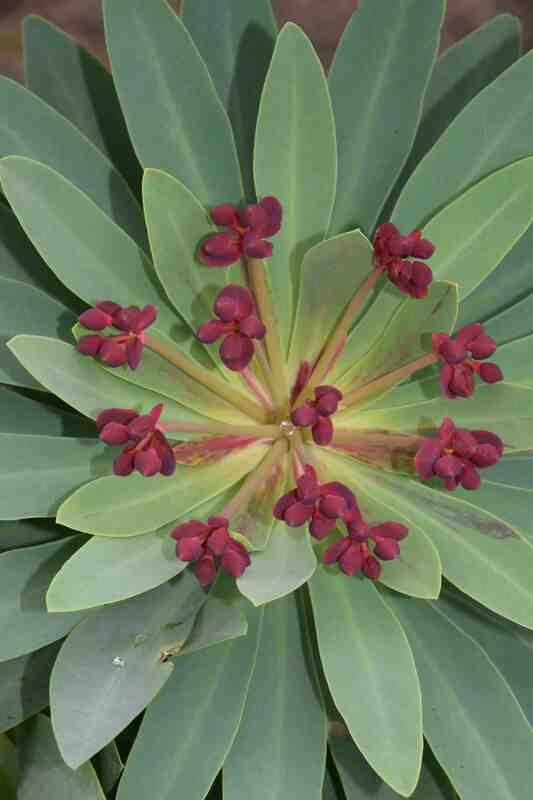 There are many euphorbias in the islands, roughly of two types: this shrubby type with small, flat leaves and the candelabra-shaped succulent euphorbias. The infloresences of this species are deep burgundy, making it the most spectacular of all the natives and among the prettiest of all. The small ‘flowers’ form a pinwheel at the ends of the flowering shoots and although flowering is usually in late winter and spring it can bloom at other times. Seed is sometimes available from rare-plant companies and it should be easy to grow in a frost-free climate in sun in a well drained compost. I am growing increasingly fond of euphorbias and this one is an absolute beauty! Can you get away with growing this outside where you are, if so it might do here with a little winter protection? Hello. I have never tried to grow this and I am sure it would not survive frost. I think seeds are available (just about) and it would make a good pot plant for summer outside and winter under cover.